Whether or not music helps concentration has been up for debate for a long time. Classical, orchestral music is a staple for people to listen to when they want to focus. This is because listening to music with lyrics can distract our brains because our brains may try to interpret the lyrics instead of simply leaving them be. Similarly, our brains also get caught up in trying to predict how a song will continue, which means listening to music that retains rhythms and melodies helps as well. Having been diagnosed with ADHD, in my experience focusing in general happens to be one of the hardest tasks to overcome. Being a college student and having a job that basically runs on creativity and deadlines, the ability to focus easily seems like it could erase a lot of stressors. Personally, I’ve found that video game soundtracks are the real deal in facilitating concentration. It makes sense, really, as to why video game soundtracks work as well as they do. Their purpose is to immerse you into a world where you must complete tasks that require full concentration. The music motivates and inspires you to not only complete tasks with vigour, but makes you want to keep playing (in this case: finish your work) and fills you with a sense of achievement when you do succeed. During stressful periods in the game, tracks may act as relaxers or something to hype you up for what is to come. It’s no wonder this type of music can help in situations besides video games. Some people may tell you to practice yoga, meditate, and drink water—and those may work wonders as well, but I’m here to tell you to sit back, relax, and get ready to feel some intense childhood nostalgia. 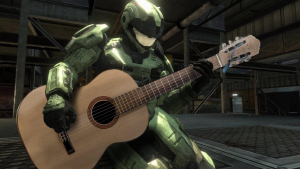 From the incredibly famous theme song alone, the Halo soundtrack is intense and carefully curated to make you feel a full range of emotion. Orchestral and acapella compositions feature a variety of intense solos. The Halo 3 soundtrack by Martin O’Donnell is packed with epic scores that fill any listener with determination. Music from The Legend of Zelda is creative and inspiring. It’s not as forceful as the Halo soundtrack but has a much more whimsical and adventurous sound. This doesn’t mean it doesn’t ignite the same passion to succeed in whatever tasks you are obligated to do. Regardless of which Zelda soundtrack you choose to listen to, it transports you to a world where you are the leader in a grand adventure. My personal favourite soundtrack (perhaps of all time) is the Alpha album by C418. Unlike the more orchestral feel of the above two video games, a lot of the original Minecraft soundtrack is made with piano and synth parts. It evokes all ranges of emotions, from the beautiful melancholy of “Subwoofer Lullaby,” wonder of “Living Mice,” and raw wanderlust and pride of “Minecraft.” You feel the blissfulness of a new world with so much to see and do encapsulated by “Wet Hands,” spine-chilling fear captured in “Thirteen,” regret in “Excuse,” and pure playful happiness in “Cat” and “Dog.” I think I can safely speak for all those who spent countless sleepless nights with their friends creating a virtual sandbox escape when I say “Sweden” may be one of the most emotionally moving video game compositions ever. These soundtracks meant a lot to us as kids. They helped us conquer the Stone Tower Temple, the scarab in Halo 3’s Ark mission, and visit the Nether for the first time (before the End existed). Now that we’re adults, though, why not make use of this music in our adult lives? It might just make this adult thing a little easier.